EnsLib.HTTP.InboundAdapter is the Ensemble HTTP listener for custom port listening, XML listening, and/or raw HTML handling. You use this adapter in cases when you prefer to listen on a private port rather than using a CSP page (which uses the standard web server to handle HTTP requests). The adapter chooses the appropriate translation table for the character set. The adapter reads the body of the input, translates it, and places it into a new stream object. If the adapter is using a non-binary character set, the stream is of type %GlobalCharacterStream. If the adapter is using a binary character set, the stream is of type %GlobalBinaryStream. 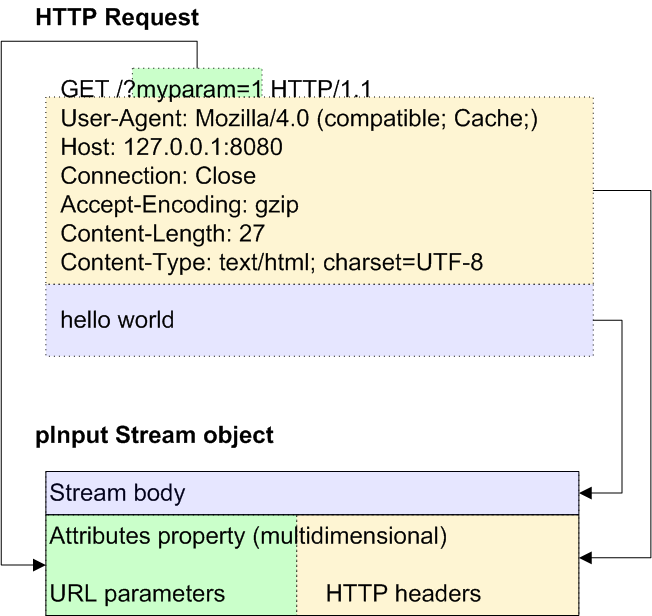 The adapter also extracts each HTTP header and adds that header to the Attributes property of the stream; this property is a multidimensional array, as discussed later. If the HTTP request is a GET request, the adapter puts them into the Attributes array under the "Params" subscript. If the HTTP request is a POST request, then the form variables are written into the request body. The adapter then calls the internal ProcessInput() method of the business service class, passing the stream as an input argument. If ProcessInput() or OnProcessInput() returns an error, Ensemble invokes the OnErrorStream() method of the business service. In your class, the ADAPTER parameter should equal EnsLib.HTTP.InboundAdapter. This step is not necessary to parse the form variables from a GET request; these are automatically parsed into the Attributes property as discussed later in this chapter. Studio provides a wizard that you can use to create a business service stub similar to the preceding. To access this wizard, click File > New and then click the Production tab. Then click Business Service and click OK. Note that the wizard provides a generic input argument. If you use the wizard, InterSystems recommends that you edit the method signature to use the specific input argument that you need; the input argument type should be %GlobalCharacterStream or %GlobalBinaryStream. Here pInput is the input that the adapter will send to this business service. Also, pOutput is the generic output argument required in the method signature. Examine the input object and extract the needed data from it. See Using the HTTP Request, later in this chapter. For the request message, set its properties as appropriate, using values obtained from the input stream. Make sure that you set the output argument (pOutput). This step is required. 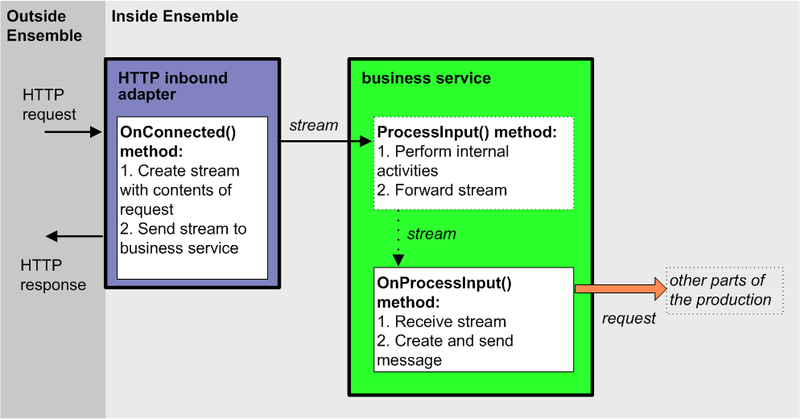 If the ProcessInput() or OnProcessInput() method of your business service returns an error, Ensemble invokes the OnErrorStream() method of the business service. You can implement this method to contain any desired error handling. The method should accept a status code as input and should return the desired output stream. The body of the request is written to the pInput stream. For information on working with streams, see the Caché documentation, for example, the chapter Defining and Using Stream Properties in Using Caché Objects. Additional data is available in the Attributes property of the pInput stream, as discussed in the following subsection. This includes the HTTP headers. If the request was a GET request, it also includes any form variables (URL parameters). If the request was a POST request, then the form variables are available in the body. Attributes("Params",form_variable_name,n) Value of the nth instance of the given URL form variable (if the HTTP request was a GET request). Specify the port on which the adapter will listen. To do so, specify the Port setting. Optionally specify the IP addresses from which the adapter will accept input, if you want to limit the sources with which the adapter communicates. Optionally specify the character set of the input data. You can permit HTTP requests from any server. This is the default. You can permit HTTP requests from a list of specific servers (optionally with specific ports). When the EnsLib.HTTP.InboundAdapter receives input, it translates the characters in that input according to a translation table. To determine which translation table to use, the adapter first determines which character set the input uses. In general, the HTTP Content-Type header of the input indicates which character set that request uses. By default, the adapter uses that character set.